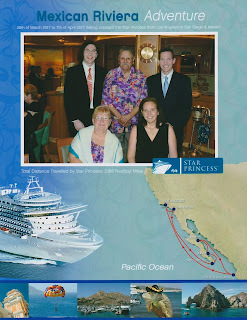 We are just returning from an adventure cruising to the Sea of Cortez. Of course within hours of landing in CA the guys had to stop at their favorite burger joint, In-N-Out Burger. 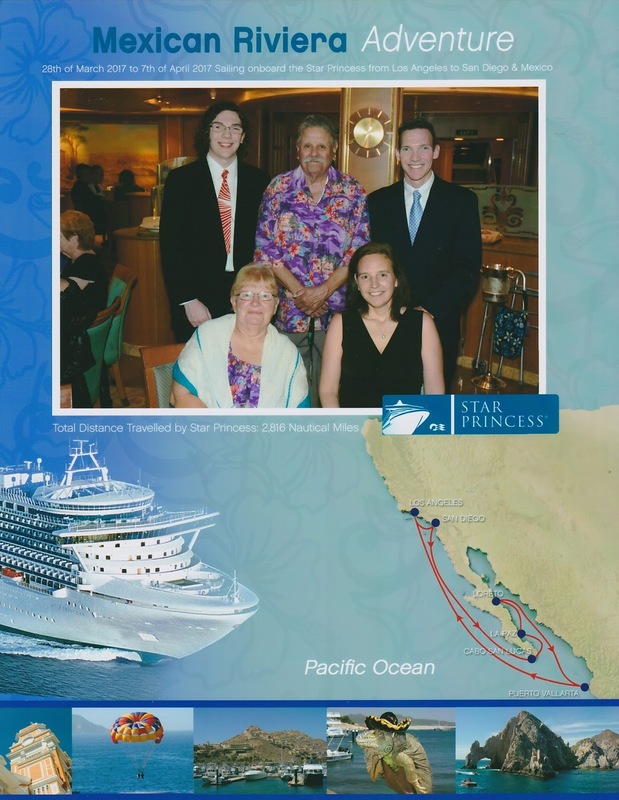 We boarded the Star Princess in San Pedro, CA. Our first stop was San Diego. We walked all along the waterfront(about 4.5 miles!) but Finn really wanted to tour the USS Midway aircraft carrier. We didn't expect it to take so long to tour. But he really enjoyed seeing what life is like on a carrier. The view from the carrier was beautiful. The day we were there the US Navy Parachute Team, the Leap Frogs, landed on the flight deck of the Midway. It was pretty awesome. After the Midway tour we traveled over to a local brewery,Bolt Brewery, before heading back to the ship. 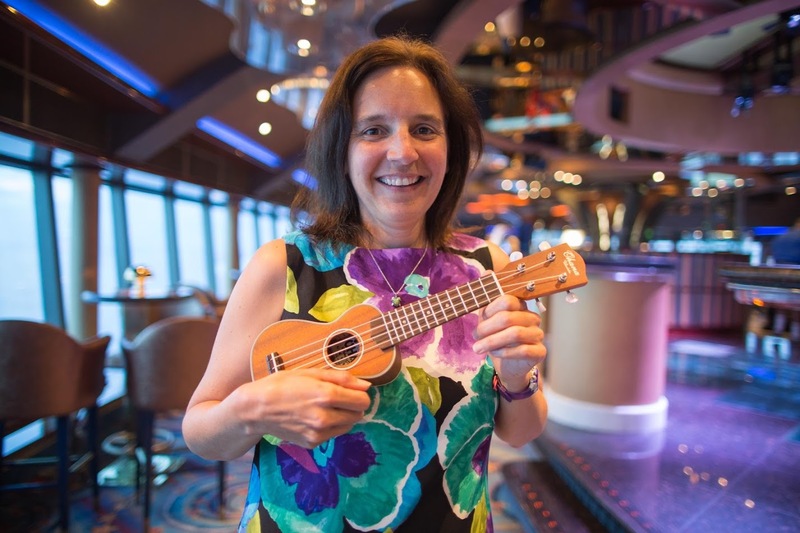 The next day was a sea day which meant time for ukulele. 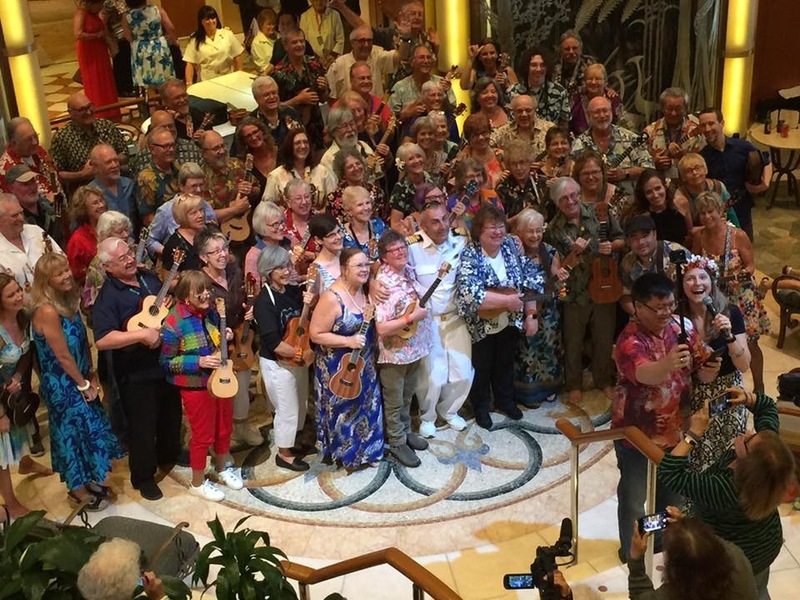 We were part of a group of 100 ukulele players on this cruise. It was my first time having to follow a schedule and attending workshops on a vacation. Our first sea day also meant our first formal night for dinner. It was nice to see my Mom and Dad every night too. Our first port was Cabo San Lucas,Mexico. It was a tender to shore port which gave us a great view of the arch. We booked a two tank scuba with Eagle Divers. 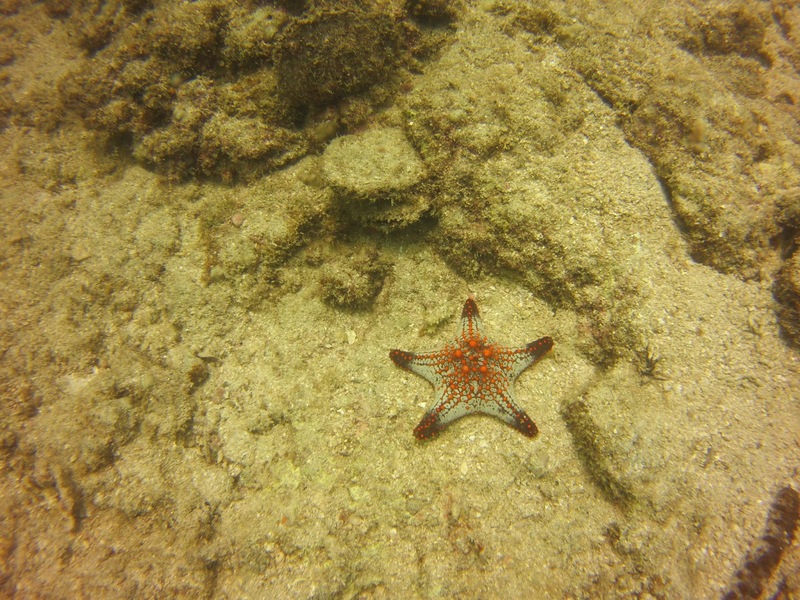 It was just the two of us so we ended up having private dives with the dive master. 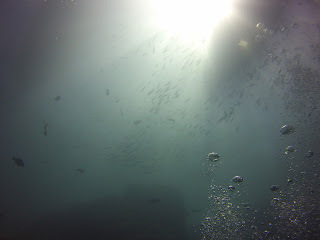 We saw a white tipped shark hanging out in a cave and several schools of fish. There was alot of boat traffic in this area so it was pretty noisy underwater which felt weird. The next day we were in La Paz,Mexico.We booked a full day excursion with Dive in La Paz. They picked us up with the dive boat right at the cruise ship dock! We headed to our first dive at Swanee Reef. Loads of beautiful fish and starfish here. 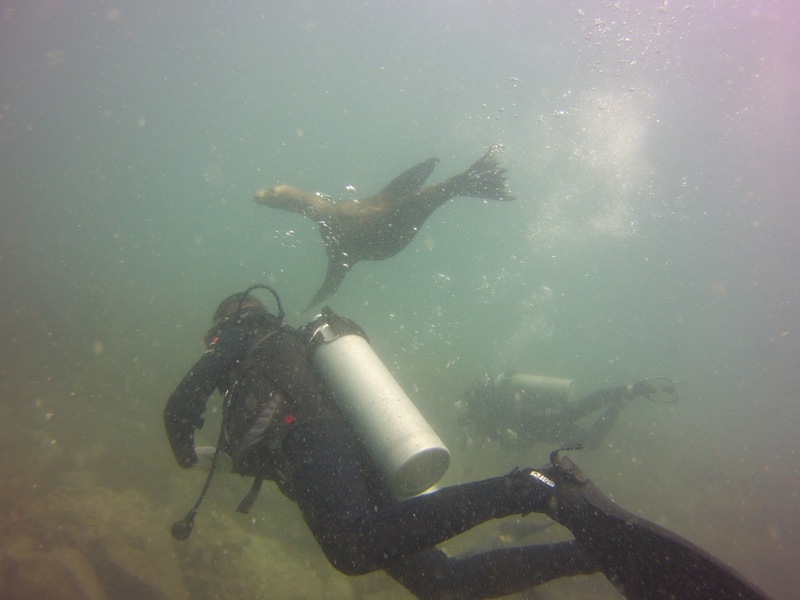 Our next dive in La Paz was at San Rafaelito Island. Visibility was poor but we managed to "bump" into a few sea lions taking a swim here. Then we headed closer to La Paz to swim with whale sharks. These are such magnificent creatures. They are so large and swim so fast it was hard to keep up with them. I could have spent the entire day here! All five of us took a day excursion to Coronado Island via Land and Sea Tours. We had an opportunity to swim with sea lions. We spied a couple of blue footed boobies along the way. We spent a few hours on this beautiful beach and had a wonderful lunch prepared for us right at the beach. A few other boats headed over to this beach too! and had a nice stop at a cafe before calling it a day. The next day was another sea day. Then it was off to Puerto Vallarta. Unfortunately we arrived an hour later than expected and missed our dive boat by 15 minutes. So we headed next door for an hour massage! We spent some time walking around the marina playing "spy the iguana". 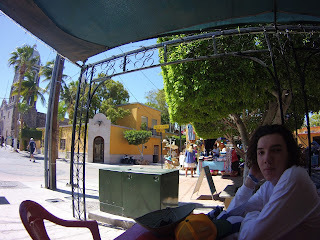 We headed back to the ship port to enjoy a few cervezas with my family. Before leaving this port we stopped across the street at a Walmart. These were displayed in a "bag it yourself" seafood aisle! Leaving Puerto Vallarta I enjoyed watching the sun sink into the sea. We enjoyed a couple of sea days before returning home. Unfortunately, there were two medical emergencies on our ship on the way home. One person was able to get to the hospital via tender boat transfer when we passed Cabo but the second, an employee, had to be airlifted via coast guard. Our last sea day included a finale performance of "Five Foot Two" by the uke group in the ship's atrium. Even the captain showed up to watch. My Dad won a couple of raffles with the uke group. 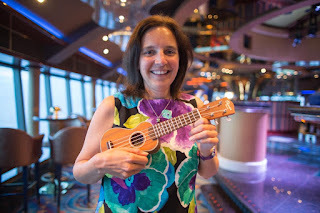 One was a baby uke made/donated by OHana that he let me take home. It's adorable! 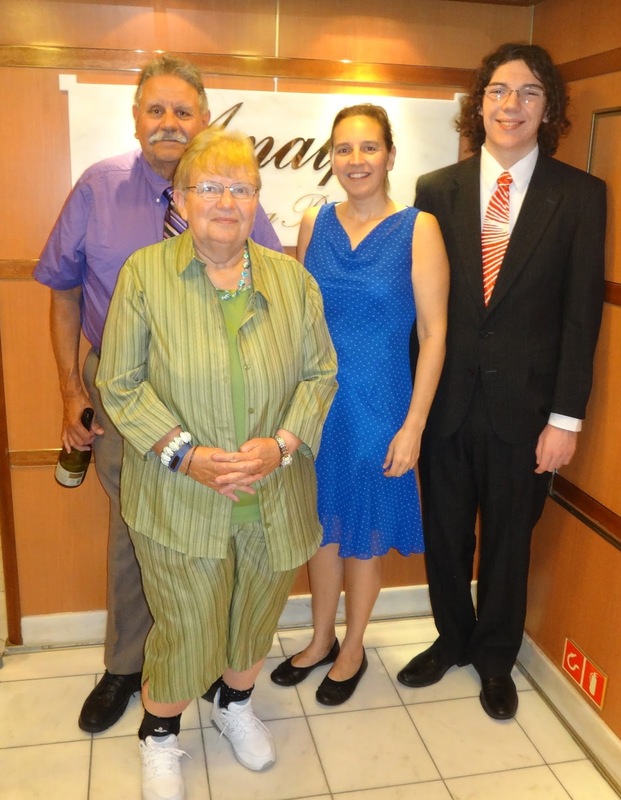 Thanks so much Mom and Dad, we all had a great time!